Suffolk are Minor Counties Champions! In the National Final today in Warwick, the Suffolk team beat Nottinghamshire by the convincing score of 9½ - 6½ to win the trophy as this year's Minor Counties Champions. The win today follows a successful season in the EACU competition, where we finished runners-up by just half a point. This qualified us to play in the national rounds, where we first beat Somerset in the Quarter-Final on 18 May, followed by Essex in the Semi-Final on 14 June. Teams playing in the Minor Counties Championship must not exceed an average grade of 180. We were fortunate to obtain the services of three outstanding juniors on our top three boards - Alan Merry, Justin Tan and Adam Taylor - whose combined age of 50 was considerably less than several other members of our team! The youngsters did us proud, scoring 2½/3 between them, including excellent wins on the top two boards. After four games had been completed, Suffolk were 3½ - ½ ahead, with wins from Mike Cook, Shaun Munson and Alan Merry, and a draw from Nick Savage. Our lead was maintained throughout the afternoon and with the score at 8 - 5 we knew we would win, because in the event of a tie, board count would have worked in our favour. Steve Gregory's win made our victory mathematically certain. 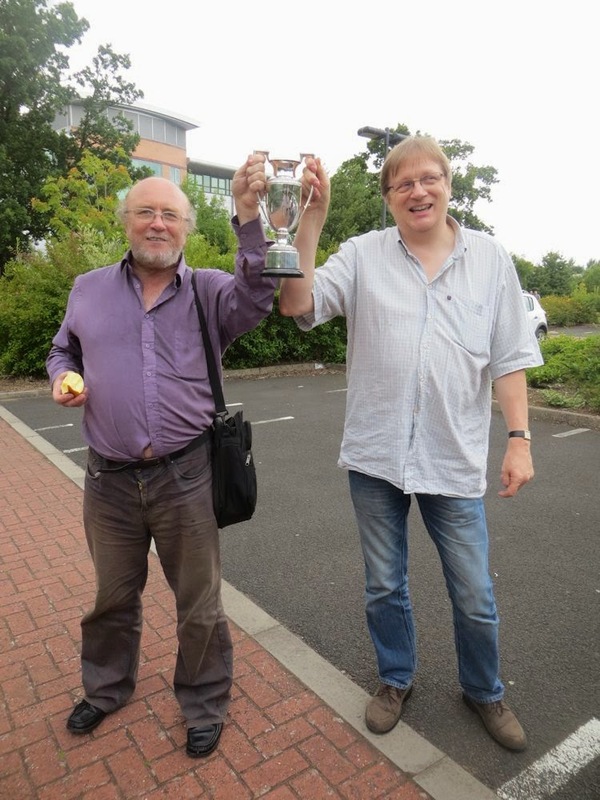 The photo shows Steve Gregory and joint captain Ian Wallis holding the trophy after the presentation. Other Suffolk winners were Shaun Munson and John Peters, whilst further draws were recorded by Adam Taylor, Rob Sanders, Silas Peck, Leon Burnett, Michael Clapham and John Feavyour. In the event, only three players lost: Graham Moore, Steve Ruthen and Ed Kirkham. In all a great team effort! Tomorrow, Saturday, sees the Finals of the County Championships. Suffolk face Nottinghamshire in the Minor Counties Final. Having (just) qualified from the EACU competition, Suffolk have gone on to conquer first Somerset, in the national Quarter-Finals, and then Essex in the Semi-Final. It has been quite a struggle to find a team with an average grade not exceeding 180, but we have done so - our team for tomorrow averages 179.3. How close can we get?! The match against Essex was a stunning victory for Suffolk, by 10½ points to 5½. There were victories for WGM/IM Dagne Ciuksyte on top board, Shaun Munson (Board 3), Steve Gregory (5), Tim Lunn (7), Rob Sanders (11), John Peters (12) and Silas Peck (13). The result of tomorrow's match will be published here tomorrow evening. Fingers crossed!